29 January 2017 – Protests against right-wing US President Donald Trump’s ban on refugees and immigrants from several Muslim-majority countries have been held in cities across the US, including in New York City and Washington, DC. In the US capital, thousands gathered outside the White House, while more than 1,000 protesters assembled in New York City’s Battery Park to demonstrate against Trump’s executive order, which places harsh restrictions on immigration from seven Muslim-majority countries. More protests are slated to take place in Baltimore, Atlanta, Austin, Dallas, Boston, Boise, Chicago, Detroit, San Francisco and other cities across the country. Jessica Taube, 37, brought her children to the protest. “I don’t believe in borders. We’re all humans and we all share the same world and deserve a place to be happy and healthy,” she told news men. A day earlier, thousands of protesters amassed at airports across the country as news spread that immigrants and travellers were being detained there. Among those detained were legal residents who carry US green cards. Demonstrators only dispersed when a federal judge blocked part of Trump’s executive order on immigration, ruling that travellers who have already landed in the US with valid visas should not be sent back to their home countries. 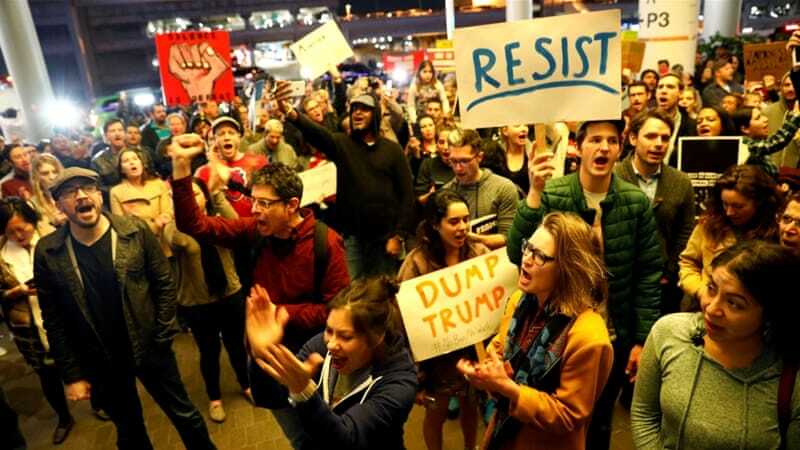 US District Judge Ann Donnelly’s ruling late on Saturday concerns dozens of people who were detained at airports following Trump’s actions. The total number of people detained was unclear. “This ruling preserves the status quo and ensures that people who have been granted permission to be in this country are not illegally removed off US soil,” Lee Gelernt, deputy director of the ACLU’s Immigrants’ Rights Project, said. Attorney generals from 16 US states – including California, New York and Pennsylvania – issued a joint statement on Sunday condemning Trump’s move. “We are committed to working to ensure that as few people as possible suffer from the chaotic situation that it has created,” the statement said. US senators John McCain and Lindsey Graham, both from Trump’s Republican Party, said on Sunday that the president’s order may do more to help recruit “terrorists” than improve US security.